Since May, Jeremy Hunt has answered only two of the 1,887 written questions asked of his department by fellow MPs. This works out at 0.1%; the remaining 99.9% have been answered by his junior ministers. He is only kept of the bottom of the ministerial league table by Michael Gove (Justice Secretary) and John Whittingdale (Culture Secretary) who have not answered a single question put to their department. George Eustice, Minister for Food, Farming and the Marine Environment, tops the table by answering a staggering 65% of the questions put to his department. According to Daniel Marten, an ex-parliamentary researcher, questions are supposed to be answered by “the minister with responsibility for that area.” More accurately, the answers are drafted by a civil servant and the minister signs them off. The question on special measures is particularly interesting as Mr Hunt left it to Ben Gummer to answer a question on the same topic yesterday. In all likelihood, this is a fuss over nothing. The Government despite its myriad and never-ending faults still has the country functioning. Perhaps it is by virtue of being freed from often technical and detailed questions that the Secretaries of State get to focus on running the country. Though it would nice to see them answering more than two, one or even zero questions put to them! Jeremy Hunt is under some pressure at the moment. From a proposed sugar tax to a massive black-hole in the NHS finances, to the ever-growing spectre of industrial action from junior doctors, it is fair to say he has quite a lot on his plate. Some would say giving junior doctors yet another gaffe to rage about would be a political mistake. In this case, ‘some’ can probably be taken to mean ‘all’. Especially if you’re currently asking said doctors to extend their sociable work hours to 7am-7pm Monday-Saturday. Prior to Mr Hunt’s interview, it seems only 0.33% of doctors had heard the phrase ‘ danger money’. Unfortunately for the Tory health team, that number is now a lot higher, after junior doctors started sharing all the times they should have earned their #dangermoney. I earn my #dangermoney by walking into a Paeds ED waiting room and declaring that Frozen is rubbish. The hashtag analytics site Keyhole states #dangermoney has now been seen by nearly 3,000,000 people on Twitter. Probably not the way Jeremy Hunt wanted to connect with doctors less than a week before a ballot on industrial action. 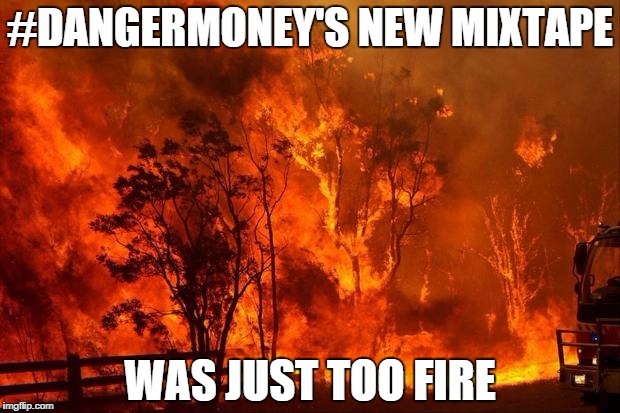 Whilst #dangermoney may sound like an aspiring rapper, and the Twitter jokes probably haven’t penetrated outside the medical bubble, the gaffe represents a bigger problem for Mr Hunt. Up until now, the health secretary has seemed like an opponent to be respected. He continued to spin figures, and manipulate the media, in a way that junior doctors feared. His methods and strategy had to be respected, even is his opinions and positions did not. This has changed. He is now longer viewed as a worthy opponent by many junior doctors. They are starting to treat him as a fool. In an interview which can hardly be described as hard-hitting, he managed to make two gaffes. By scraping the barrel and coming up with ‘danger money’, Hunt is starting to look like a panicked man with no real strategy. Repeating discredited arguments in the face of ever-growing opposition, Hunt has seemed unable to change his approach once he is challenged. If he wants to see how well that can go, he only has to rewind to George Osborne’s forced capitulation on tax credit reform on Monday. It is time for Mr Hunt to drop preconditions and get back around a negotiating table with the BMA. Battling with the most trusted profession in the country is not a good look. Especially when the other side is seeming more and more confident that it can win. ‘Bacon As Dangerous as Smoking.’ Except It Isn’t. Technically they are not wrong, but they are misleading. The WHO has announced there is as much evidence processed meat causes cancer as there is smoking does. As a result, it is now classed as an IARC1 carcinogen e.g. one with lots of evidence. The WHO haven’t quantified how much cancer processed meat causes. Nor have they said how likely you are to die from such cancers. As an analogy, think about driving a car. There is good evidence not wearing a seatbelt will mean an increased chance of harm. There is good evidence driving a car after a bottle of Buckfast will mean an increased chance of harm. However driving after Buckfast is much more dangerous than driving without a seatbelt. Having equal evidence that something is harmful does not make them equally harmful. This is absolutely 100% untrue. “Most carcinogenic” means ‘having the most potential to cause cancer.’ The UN has said there’s evidence a 50g portion of processed meat a day increases your chance of colorectal cancer by 18%. This study found smoking made you thirteen times more likely to get lung cancer, or a 1300% increased chance. Not to mention the other cancers smoking can cause such as bladder cancer. I’ll hope you’ll agree the two do not have the same potential to cause cancer. I won’t attempt to figure out how many slices of salami you’d need to eat to increase your risk of cancer to that of smoking, as I’d almost certainly be committing a statistical sin of the worst kind. If I had to guess, I’d say at least a small pig each year. What I will say is the Guardian is horrible misleading in the introduction of this piece. Sure, they clarify further down and make exactly the points I’ve made, but the damage has been done. Most people will never get down to reading the body of the text. They will stop at the headline and go away thinking that hot dogs are as bad for you as a twenty-a-day habit. This is simply not the case. If you thinking I’m picking on an isolated case in the Guardian, I’m not. They were just the first paper I saw when I searched for the story. I could have picked nearly any paper in the UK and found a similar headline. Many people are likely to cut down processed and red meat as a result of this media buzz. This will probably make their lives healthier and cheaper in the long run, which is clearly a good thing. It’s just a shame it took misleading scare stories for the health benefits of eating less meat to come to national attention. The House of Lords voted against the Government tonight on tax credit cuts. Tory MPs are understandably unhappy, the PM and Chancellor are distinctly miffed, and even I’m a little concerned. I’m not worried about the tax credit issue. I think the Lords have made a sensible decision in making sure the policy has a little more thought put into it, as they usually do. I am concerned though about an unelected chamber over-riding an elected one, even if I agree with the decision they make. I even agree that there are legitimate constitutional precedences that allow them to do what they have done. But the key decisions should be made by elected representatives, not those who donated lots of money to a political party. However, a directly elected Lords would face the same problems as the Commons. It would become more divided on party lines, less able to act as a revising chamber and generally everything would get worse not better. Which is why I like the thought of an indirectly elected Lords based of election results that already occur. We’ve got six seats over so we’ll give them to the six highest candidates from other parties who ran for Parliament. Why? Because this is my mythical creation and I like the thought that a Yorkshire First candidate polling 7% might get in the Lords. This gives us a chamber that reflects how the population actually voted, without a single party having a majority. Hopefully this would give some actual cross-party consensus to each vote. If there was massive opposition to something e.g. tax credit cuts, then the Lords would have a mandate to oppose it without causing a constitutional crisis. The system also allows for some pretty funky options. And by funky, I mean politically funky. Which is to say not at all funky. Fancy a federal Lords? Fine, give each UK nation 125 peers and watch as the SNP are still irritated at not having that much of a say. Having had a quick fudge of the numbers, this idea is a path to insanity. The DUP gets 32 peers whilst the Greens get 10, and Northern Ireland elects 9 independents – some of which would almost certainly come from the Cannabis is Safer Than Alcohol party. Mind you the SNP have 62 times as many MPs as UKIP for a lesser share of the vote under our current system so we can cope with abject strangeness. If you’re really brave, you can let the counts change at other elections. The Scots vote 90% SNP in their parliamentary elections? Have a bigger, yet still not that significant, slice of the pie. Lib Dems clean up at the local elections? A laughable prospect but give them a few more peers. Some how the Cornish Independence party gets an MEP? Why not give them a House of Lords seat just for a giggle? Think this sounds insane and unworkable? Well if given a fresh chance to start the Lords again, I doubt we’d decide on an unelected chamber with 600+ representatives that included bishops and some inherited. The House of Lords is a democratic nightmare and its a shame that a consitutional crisis is what it takes to bring it into the national spotlight. Labour have announced that they will use Parliament’s session next Wednesday to debate junior doctor contracts. Heidi Alexander tweeted saying the contract must be ‘safe’ and ‘fair’ for doctors and patients. I've called an Opposition Day Debate next Wednesday on #juniordoctors. New contract must be safe for patients & fair for junior doctors. Labour were able to call the debate as next Wednesday is a designated ‘Opposition Day’ – days assigned to non-governing parties to discuss topics they feel are important. In a move which will please the citizens of Redcar, Scunthorpe and Rotherham amongst others, Labour have elected to discuss the ongoing crisis in the steel industry as well. The debate is the latest in a string of Parliamentary activity on the issue. 44 MPs signed an Early Day Motion condemning the contract offered by NHS Employers. The motion has earned cross-party support with Labour, SDLP, DUP, SNP and Green MPs signing it. No Tories have signed the motion, though x-health minister Dr Dan Poulter and Dr Sarah Wollaston, the respected chair of the Health Select Committe, have publicly condemned the new contracts in the past. It will be interesting to see whether Jeremy Hunt will attend the session, having avoided an emergency debate on the financial state of the NHS earlier this year. 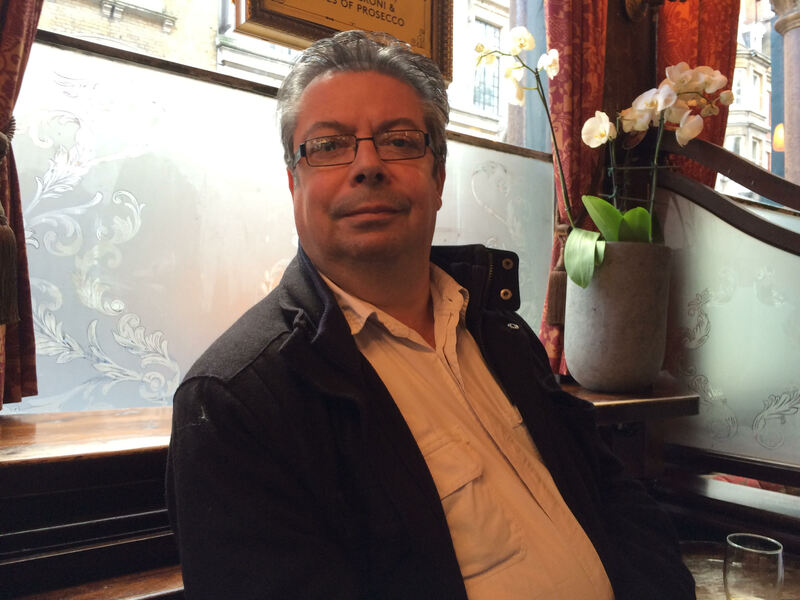 Do the British public know, or even care, about the EU referendum? The Bank of England will reveal their findings on Wednesday into the effect Brexit could have on the nation’s finances. Mark Carney, the Bank’s governor, will give a speech at Oxford University, coinciding with the release of a more detailed written report. Carney courted controversy last year when he intervened in the Scottish independence referendum. That campaign engaged the public to a degree not seen before in British politics. Could the EU decision generate similar enthusiasm? Notebooks in hand and iPhones on record, we went out into the bustling area around Oxford Street to see what people thought about the EU referendum. Outside the pub, and wishing to move outside the EU, one man agreed to talk for as long as his cigarette took to finish. He believed EU rules and regulations took authority away from Britain. “We give them way too much money, and then they tell us what to do!” The prospect of an independent Britain gave him some hope: “It will be much stronger, much better than it is right now, being dictated to by European arseholes”. 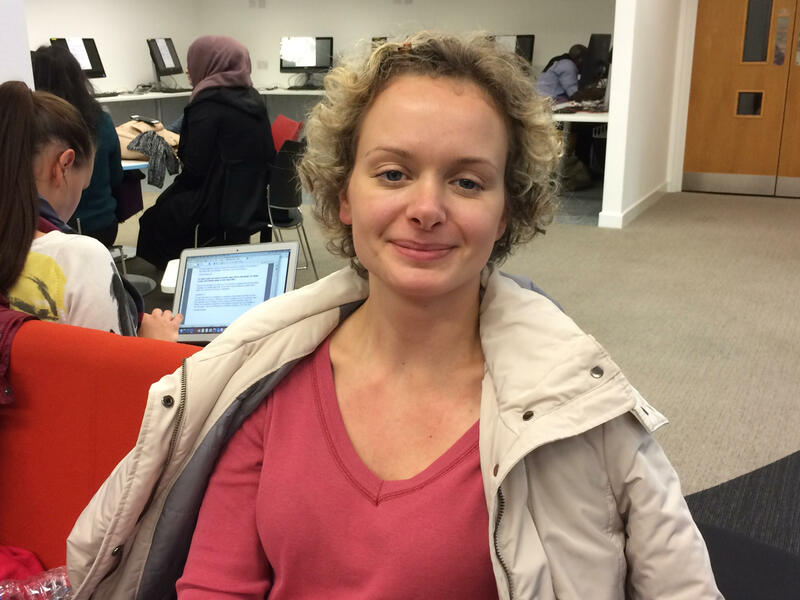 Alexandra, a University of Westminster student, happily chatted despite being interrupted in the library. “I would vote for the UK to stay in the EU.” She didn’t think Britain would vote to leave, but if it did, it would be a stupid decision. According to her, countries couldn’t be separated in today’s world, and needed to cooperate with everyone else. What should interest activists on both sides of the campaign is that no-one spoken to knew the name of any of the three official groups: Leave.EU, Vote Leave, and Britain Stronger in Europe. These groups will need to look at ways to change this. With 17% of voters undecided, and a 5% lead in favour of staying in, there will be plenty of developments still to come. 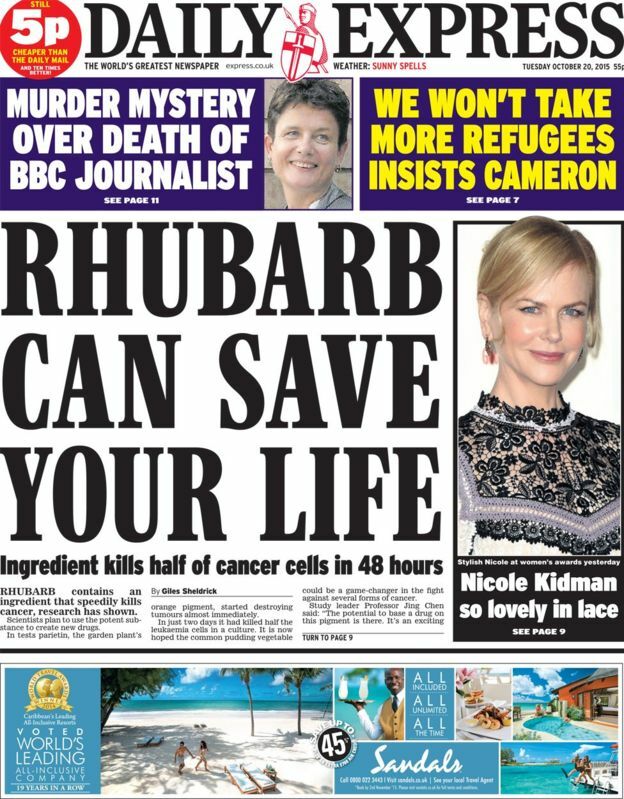 So a more accurate headline would be ‘Chemical found in rhubarb kills 50% of leukaemia cells under controlled laboratory conditions’. Not catchy I admit, but certainly not misleading.